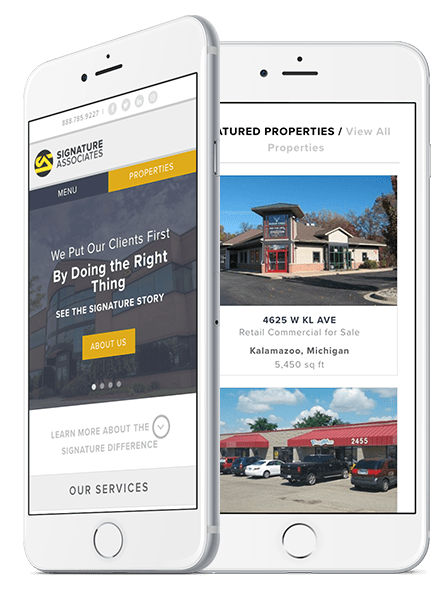 Signature Associates WM came to us in need of a strategic marketing partner who could help them increase their visibility and growth on the West side of Michigan. In order to do so, they needed a concept that would help to drive awareness for prospective real estate buyers on their website. The agency they worked with previously had not met their expectations, so they were eager to find a partner like ManoByte that could truly deliver results. Working collaboratively, the ManoByte Team turned their dreams into a reality with a sleek website leveraged by HubSpot and inbound marketing best practices. Our design and development team completely rebuilt the Signature website and migrated it over to the Hubspot platform. Because the previous site was confusing and bulky, it wasn't easy for the Signature team to update. Additionally, they wanted to differentiate themselves from their presence on the East side of Michigan. Our team simplified the structure of the site as well as added some unique features such as the 'Featured Properties' section, a blog page, and educational resources. By making these updates, we are able to drive more traffic to their website and convert potential prospects into more qualified leads.